Why BCN did this pump? In the early morning hours of May 8, Binance announced that it had opened trading pairs for BCN with Bitcoin (BTC), Ethereum (ETH), and the exchange’s own Binance Coin (BNB). What quickly followed was its monumental rise from an opening price of 320 satoshis to a closing price of 2415 satoshis in just five hours. As of press time, however, prices have cooled back down to around 200 satoshis. The glaring price disparity between BCN’s trading price on Binance versus its price on its only other two major exchanges, Poloniex and HitBTC. While BCN soared to over 2000 satoshis on Binance, it remained stagnant at around 200 satoshis on its other exchanges. Why was nobody taking advantage of this arbitrage opportunity of a lifetime? In order to understand where Binance’s price pump came from, one must take into consideration two different factors: Bytecoin’s high degree of centralization in the hands of its developers, and its low number of trading pairs across some exchanges. Bytecoin is no new cryptocurrency. Launched as far back as July 2, 2012, Bytecoin is an anonymous cryptocurrency that was the first to implement Cryptonote, an application layer protocol that prevents transactions from being followed through the blockchain , yes like monero. Despite holding the honor of being the first “privacy coin,” it has since been overshadowed by its more well-known competitor Monero, which was itself a fork of Bytecoin. Monero has since deviated extensively from Bytecoin’s original codebase and now holds the thirteenth highest market cap on CoinMarketCap. So if Bytecoin had the first-mover advantage as a privacy coin, why did it lose the crypto race to Monero or other similar coins? The reality is that 82% of the coins were already mined before its “public” release. Even if the premined coins weren’t done so maliciously, it still means 82% of the coins in the hands of persons unknown and invisible. It basically centralises a decentralised currency. This high degree of centralization meant that not only would the developers reap the most profits from the coin, but its low circulating supply made it vulnerable to massive market manipulation. The community’s distrust is eventually what drove most traders towards (MXR) Monero. So when Binance opened up BCN to trading, there was already limited opportunity for traders to sell their BCN. Before long, Binance began to experience deposit and withdrawal delays on BCN, which the site itself confirmed several hours after trading began. But then further problems began to compound the issue. First, HitBTC announced on its Twitter at 9:43am EST that it had disabled all BCN transactions, presumably due to network issues. Hot on its heels was an announcement from Poloniex at 9:40am EST that it had it had also disabled BCN withdrawals and deposits following network issues. BCN transfers across all exchanges had effectively ground to a halt. We’ve disabled Bytecoin deposits and withdrawals while the network is experiencing issues. Stay tuned. What quickly developed was a miniature BCN bubble isolated entirely on Binance’s exchange. With no way to transfer or sell any Bytecoin, BCN’s price on Binance outpaced its price on both of its other exchanges by a wide margin. Late in the evening of May 8, BCN continued to trade for well over eight times its market value on Binance alone, although this price disparity has since diminished significantly. What goes up, however, must come down. Bytecoin’s price now sits at around 250 satoshis on Binance, 50 satoshis below its opening trading price. This incident only mirrors BCN’s past performance, which has frequently risen and fallen following market trends. BNC enjoyed a massive pump during crypto’s bull run in May 2017, only for it to fall off in the following months. 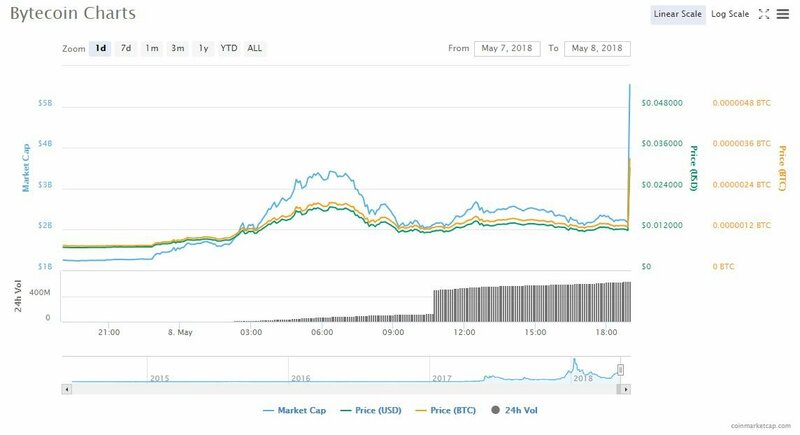 More recently, it lost a whopping 85% of its value during this year’s bearish winter following a price surge during December’s crypto frenzy. Bytecoin, however, refuses to throw in the towel. It continues to announce partnerships with companies and new updates, such as its partnership with Lydian as recently as this January. With trading now opened on Binance, one of the largest and most popular exchanges in the world, Bytecoin still faces an uncertain future as a relatively obscure privacy coin.